MCG Pro Rev A Dual Trigger Issue? I'm just wondering if anyone is experience issues with the dual trigger not he MCG Pro. I can't seem to consistently activate stage 1 only. I have some luck when pulling at the top of the trigger, but pulling from the bottom activates both then I can release the second stage as I let go. Just trying to determine if this is design, or a QC issue. Re: MCG Pro Rev A Dual Trigger Issue? From my post on reddit yesterday. So yesterday I finally set up my stick and after a bit of playing around I found the #20 stock spring to be a bit loose for my liking. During my testing all the buttons were registering on both the Windows and VKB's Wizzo software. Today after changing out the springs to #30 and setting it up I have discovered that the primary triggers stage one (button 1) is no longer working. Does anyone know of anything I did? I did not drop the grip or gunfighter base, all the connections on the gunfighter seem to be connected and all buttons from 2-24 are registering correctly. I ended up taking the stick apart. It seems like the board with the trigger switched became unaligned. I got it working as expected by moving the circuit board around and testing with the stick opened. The trigger board is on a guide and has room to slide out of position relatively easily. After playing maybe 10-15 minutes of star citizen the problem reappeared and and now only button two is activating and not button one. 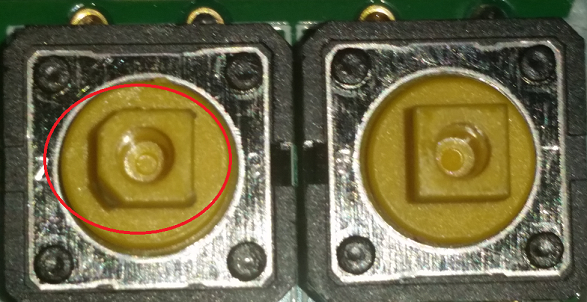 There seems to be a manufacturing issue with keeping the circuit board in place. I have tried to contact VKB and am waiting on their response. This most likely will have to be returned. I should have to be taking apart my stick every 10 minutes when I spent $400 on a flight system. what also interesting is that the first stage clicks but does not register. When I had the grip apart I used my finger to trigger the button and the button was registering. Its almost if the press isnt strong enough to engage the button fully. When I repositioned the trigger board it worked but I cannot keep the board in place. After playing maybe 10-15 minutes of star citizen the problem reappeared and and now only button two is activating and not button one. There seems to be a manufacturing issue with keeping the circuit board in place. ADMRL wrote: seems like the board with the trigger switched became unaligned. I got it working as expected by moving the circuit board around and testing with the stick opened. The trigger board is on a guide and has room to slide out of position relatively easily. Hi. "Standing Cow" had, I believe, passed our message to you. Perhaps the guy at the assembling line screwed the spring a bit too deep into its base. Hence, solution One: using tweezers, turn the spring counterclockwise like half a turn or a bit more depending on how much of it remains fixed in the base. Solution Two: stick a tiny patch of masking tape onto the top or bottom or both sides of the board and slide it back into its guides so it stays there as if bolted down. It is a shame that we overlooked the spring mis-positioning but as I know from experience, it takes only a few minutes to fix it, and I hope it does not ruin your pleasure. We will of course make sure it does not happen in the next batches of the MCGs. Thanks for blowing the whistle. On a sidenote: please always begin from opening a ticket at the shop. We're trying to optimize the aftersales and support pipeline now, and make shops do their jobs while we are doing ours. Thanks im new to the community. I am not sure how to reach the shop to open a ticket. When contacting vkb via email I was told to post on the tech support forum. Sorry for any inconvenience. I rotated the spring and taped the trigger pcb with electrical tape for good measure and it seemed to do the trick. ADMRL wrote: Sorry for any inconvenience. Nah that's absolutely OK We're trying to make things a bit more streamlined, so some mess is possible during transition period. Anyway you're totally within your rights and did the thing most obvious, so you're not to blame. It will settle down with some time. ADMRL wrote: I rotated the spring and taped the trigger pcb with electrical tape for good measure and it seemed to do the trick. Great it works, and really really sorry for stealing a day out of your flight experience. BTW, electrical tape is a bit less than ideal for the purpose: it's smooth (if we're talking about PVC tape, not old-style fabric type), so it does little in the way of preventing the PCB from sliding back and forth. Masking tape is made of rugged paper and provides more friction. But it's OK as long as it works, and you know what to do if the problem comes back. Hope it doesn't though. Do not take my words as if I discourage you from being active on forums, so don't hesitate to come again. I'm just trying to channel emergency first aid requests to shops, and discussing the results of this help to forums. We're not trying to hide our flaws in silence, in fact it's [nearly] the opposite: we're trying to educate as many folks as possible how to manage small screwups by themselves. But when the previously unknown bug shows up we prefer it first to be dealt with by specialists, not the public. zenmonkey wrote: I'm just wondering if anyone is experience issues with the dual trigger not he MCG Pro. I can't seem to consistently activate stage 1 only. I have some luck when pulling at the top of the trigger, but pulling from the bottom activates both then I can release the second stage as I let go. Just trying to determine if this is design, or a QC issue. Sorry for this, and sorry for your time wasted. I saw you had been already advised on what to do. Sorry once again, and I am moving these posts to the older thread (not deleting) to unclutter the forum. So I've encountered the same issue. I've opened a support ticket, but I have not heard back yet on what the long term solution is. The spring shipped doesn't seem to be up to the task. I've used the workaround of 1) adding masking tape to the top/button edges of the board so it's held firmly. 2) Placed a small piece of cardboard in between the spring so there is enough pressure. What is the long term solution to this? Are newer MCG Pro handles shipping with a different spring now? Crazy thought that would probably not work but in some constructed mattresses they use coil springs that are essentially plastic shrink wrapped with openings at ends to let air in and out obviously. I wonder if a small thin piece of heat shrink tubing in this case might work to prevent spring bending by providing a little bit of along-axis stiffness. I'm thinking doubling up the same spring to give it a bit of force. I logged a support ticket, but they only mentioned the 'unscrewing' of the spring a bit. This doesn't make sense to me. The spring seems to easily slide to the base of of the button, and simply slides over the post on the trigger on the other side. There is no option to 'unscrew' anything that I can see. It just doesn't have enough pressure right now without adding that little card board piece. It bows when it should compress. I'm thinking doubling up the spring or getting a spring that is firmer is the best option. So my first stage trigger failed again, even with the workaround cardboard. I tried to figure out how to unscrew this spring more, but it just slides over the button all the way. I had a look at the board, and the button looks deformed on the primary trigger. I'm waiting on VKB support at this point.